This is a scalable context timeline. 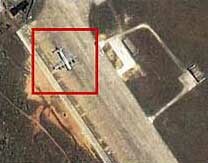 It contains events related to the event April 6-7, 2001: US, China Still in Dispute Over Spy Plane Collision and Crew Detention. You can narrow or broaden the context of this timeline by adjusting the zoom level. The lower the scale, the more relevant the items on average will be, while the higher the scale, the less relevant the items, on average, will be. 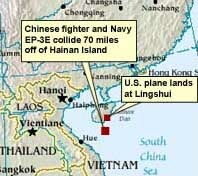 A map showing the location of the collision, and of the Hainan Island airfield where the crippled EP-3 landed. [Source: Military.com]A US EP-3 Aries II spy plane collides with a Chinese fighter jet over the South China Sea. The fighter crashes, killing the pilot; the EP-3 makes an emergency landing at a Chinese air base on China’s Hainan Island, a landing described as illegal by Chinese officials. 24 American crewmen—including three women and eight code-breakers—are taken into custody by the Chinese. The incident is the Bush administration’s first real foreign-policy crisis. [CNN, 4/2001; BBC, 4/5/2001] The precise location of the US plane is in dispute, with US officials saying that the plane was in international airspace when the collision occurred, and Chinese officials saying that the aircraft was over Chinese airspace. [PBS Frontline, 10/18/2001] Some military experts say that the crash is likely the fault of the Chinese pilot, who may have been engaging in what they call a pattern of “deliberate confrontation over the South China Sea, sending its fighter jets to harass American surveillance planes in international airspace.” [Capitalism Magazine, 4/9/2001] Navy Admiral Dennis Blair, commander of the US Pacific Command, supports the experts’ opinion on the Chinese pilots’ behavior towards US aircraft, telling the press, “I must tell you though that the intercepts by Chinese fighters over the past couple months have become more aggressive to the point we felt they were endangering the safety of Chinese and American aircraft. And we launched a protest at the working level. This is not a big deal, but we went to the Chinese and said, ‘Your aircraft are not intercepting in a professional manner. There is a safety issue here.’ So, this was a pattern of what we considered to be increasingly unsafe behavior.” Aviation expert Jim Eckes concurs: “Aviation protocol demands that the quicker plane take steps to avoid the larger, slower aircraft, which in this case was the EP-3 belonging to the US.” [CNN, 4/2/2001] Senator Richard Lugar (R-IN) says that the Chinese pilot who died in the collision, Wang Wei, was known to have challenged US surveillance planes before, but this time Wei—who apparently died when he ejected from his aircraft and was pulled into the EP-3’s propellers—“exceeded his grasp.” The Chinese have a different story: “the immediate cause of the collision was the violation of flight rules by the US plane which made a sudden and big movement to veer towards the Chinese plane,” according to a Defense Ministry spokesman. “The US plane’s nose and left wing rammed the tail of one of the Chinese planes causing it to lose control and plunge into the sea.” Analysts from Jane’s Defense say that two Chinese F8 fighter planes “hemmed in” the larger, slower EP-3 in an attempt to make it change course, and thereby caused the collision; one source reports that one of the Chinese fighters was actually flying directly underneath the EP-3. [BBC, 4/5/2001] The aggressive and dangerous behavior of the Chinese pilots is later confirmed by the account of the collision by the pilot of the EP-3, Lieutenant Shane Osborn, who says, “He was harassing us.…The third time he hit us, is that an accident? I don’t know. Do I think he meant to hit us? No. I don’t think he meant to have his plane cut in two and go under the ocean. But his actions were definitely threatening my crew in a very serious manner and we all saw what happened.” [PBS Frontline, 10/18/2001] Almost immediately after the EP-3 lands, Chinese troops board the plane, ignoring a Pentagon warning to stay off the plane; on April 2, US ambassador to China Joseph Prueher confirms this, saying, “There is little doubt they have been over the airplane.” The EP-3 is filled with highly classified surveillance equipment. The US initially blames China for the crash; the Chinese say the opposite. President Bush’s demands that the plane and crew be returned immediately are ignored [CNN, 4/2001; Reuters, 4/4/2001] on April 2, Prueher says, “To date, we have been granted no access to either the crew or the aircraft,” and calls the lack of access “inexplicable and unacceptable.” [CNN, 4/2/2001] On April 11, the Chinese will return the US crew to American custody, but will retain the plane until July 2001 (see April 11, 2001).